Israeli soldiers sealed shut, on Friday evening, a the front entrance of a Palestinian home in the al-‘Arroub refugee camp, north of Hebron, in the southern part of the occupied West Bank. 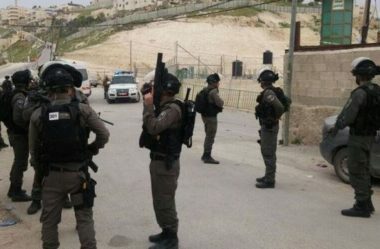 Media sources in Hebron said dozens of soldiers invaded the refugee camp, and the surrounding areas, before storming a home and sealing it shut, to prevent the Palestinians from entering it. The sources added that the Israeli colonialist settlers tried to force the family out of their home, in order to illegally occupy it. On Thursday, dozens of illegal colonists surrounded the home, and many of them attacked the family, while Israeli soldiers assaulted many Palestinians who rushed to aid the family. The property is owned by a Palestinian, identified as Ahmad Abu Srour, and is located near Beit al-Baraka compound, which was illegally taken over by colonialist settlers several years ago, who claimed that they bought it from a Swedish company. On Monday, August 6th 2018, Israeli settlers, escorting a bulldozer, demolished two Palestinian homes at Beit al-Baraka church compound, despite the presence of a court order allowing the families to stay in their homes, according to the owner of the two homes, Ahmad Samara. Beit al-Baraka, meaning “House of Blessing,” built 70 years ago, is a 38-dunam (9.5-acre) church compound located near the al-‘Arroub refugee camp, on the main road between Bethlehem and Hebron, opposite to Arroub refugee camp. It used to serve as a hospital providing free treatment to people suffering from tuberculosis until it was shut down in 1983. Jewish settlers later fraudulently bought the compound from the church, through a fake company. An American missionary, identified as Thomas Lambie, constructed the buildings after coming to Palestine in 1947. Lambie constructed a tuberculosis hospital on the site and was buried on the property after his death in 1954. Beit al-Baraka was illegally annexed to Gush Etzion colonialist block on October 1st, 2015.